Jerrie Kreuzberg was a friend, a shining star of Thursday afternoon Bible Study, and a wonderful example of Christian living. 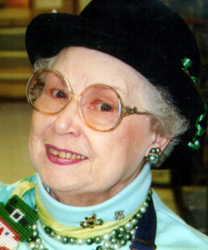 Jerrie was an impeccable dresser; for every outfit she wore, she had matching shoes, sneakers and jewelry. Completing the outfit was a matching hat, the most notable was the silver sequined cap resembling a disco ball. Jerrie was multi-talented; singing and music were always a part of her life. She got a full scholarship to Curtis, and had many successes in music. She was also a cartoonist and a poet. Through all of this, she felt her greatest accomplishment was becoming a mother. I had the blessing of taking Jerrie shopping at Giant for the past 2 years; while there she always met at least six people she knew. While at Giant, Jerrie headed to the produce, and I would head for the cat food. Her critters, both indoor and outdoor, were so important to her. She actually fed her cats spaghetti and meatballs once a week. Jerrie died peacefully in her own bed, dressed and ready to go shopping. Pictured below, Jerrie's outdoor cats.